Born: 4th June 1881, Dover, Kent. Died: 28th June 1916; age 35; Died of Pyrexia/Heat Stroke at Mesopotamia. Rank: 1st Class Stoker, Service Number: Ch/292393(R.F.R.Ch.B.7741). Regiment: Royal Navy, H.M.S. ‘Proserpine’. Relatives Notified & Address: Son of John Henry Dray, of Shepherdswell, Dover; husband of Alice Rose Dray, of 90, Woodhouse Street, St. Clement’s, Ipswich. 1891 Botolph Street, Sibertswold, Kent. Edward was 9 years old and living with his father, siblings & stepmother. John Henry Dray, 52, an Agricultural Labourer, born Hawkinge, Kent. Fanny Dray (nee Burton), 49, born Nonington, Kent. Fanny Dray, 10, born Alkham, Kent. Rose May Dray, 10, born Alkham. 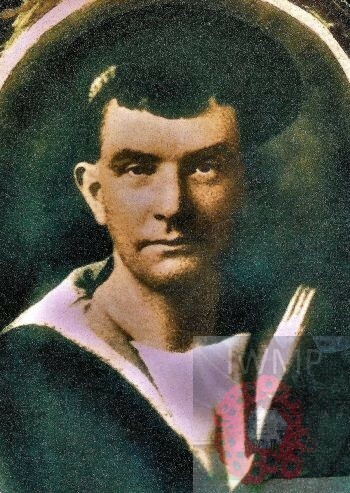 Edward was 29 years old, married and a Stoker on board ‘Implacable’ a battleship and part of the Atlantic Fleet. In 1911 Edward’s wife & children were living with his in-laws at 82, Woodhouse Street, Ipswich. Alice Rose E. Dray, January 1907, Ipswich. Edward James Dray, May 1908, Ipswich. Grace Lily Dray, 1910, Ipswich. Arthur F. Dray, 1912, Ipswich. Patricia Beatrice Dray, 1913, Kent. Kathleen D. Dray, 1915, Kent. Edward’s mother was Sarah Dray (nee Prescott), born 1884, Swingfield, Kent – died 1886, Dover, Kent. Edward’s stepmother, Fanny Dray, died 1914, Dover, Kent. 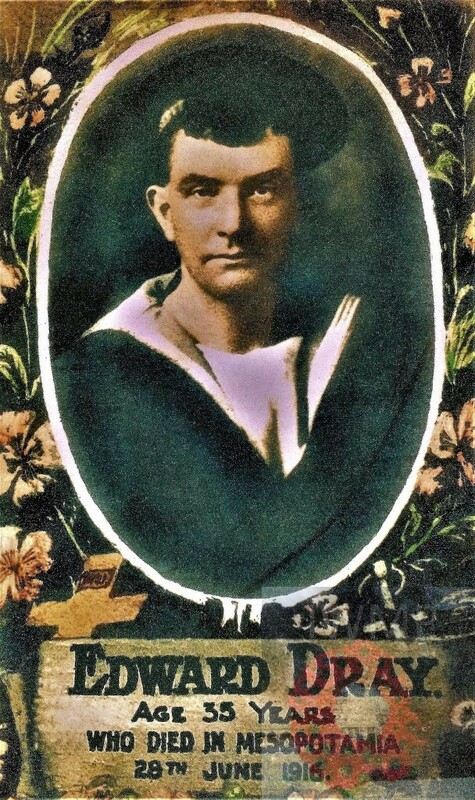 Edward’s father John Henry Dray died December 1917, Dover, Kent.